Dead Set is a British television horror drama created by Charlie Brooker in 2008. Charlie Brooker is also the creator of the Black Mirror TV show which I recommend checking out. Dead Set takes place mostly on the set of a fictional series of the real reality TV show Big Brother. There are five episodes chronicling the dawn of the zombie apocalypse that strands the housemates and production staff inside the Big Brother House. The world is going to hell outside and for a while, they have no idea. And when they do figure it out the Big Brother House becomes a safe haven. But of course, that doesn’t last long. The Big Brother contestants are mostly shallow, self-obsessed celebrity wannabes and even before the zombie apocalypse there was some conflict. When the state of affairs is revealed to them, their personalities are accentuated. In most cases, it’s not very flattering but, hey, it’s the end of the world. Apart from the Big Brother contestants, there is a mean and ambitious producer, an assistant, Kelly Povell (played by Jaime Winstone) who is the story’s hero, and her boyfriend who is trying to get to the studio. The show is only five episodes long. The first episode is 45 minutes long and the next four are 24 minutes each. It’s basically like a long movie. It is very good though. The zombies look like zombies should. The make-up and special effects are flawless. The story is funny and exciting and the acting is top-notch. They say that the Walking Dead is a zombie soap opera. 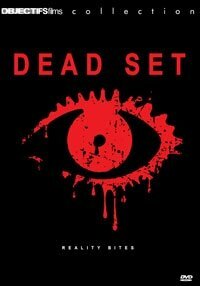 If you were to compare, then Dead Set is a zombie thriller. It never loses pace or focus. You need to watch this one.